On 12 September 2008 at 4:22 p.m. a commuter train carrying 225 riders in California’s San Fernando Valley, collided with a freight train at 83 mph. The crash came to be known as the Chatsworth crash. 135 people were injured and 25 died. One of the people who died was a man named Charles E. Peck. He was in the prime of life at just 49-years-old and was a customer service agent for Delta Air Lines at Salt Lake City International Airport. His fiancee lived in California and he wanted to be closer to her, so he was traveling aboard the train to Los Angeles for a job interview at Van Nuys Airport. This is generally where the story would end. A tragic death. But Charles was not finished with his life here and he was about to embark on some truly unexplainable communication. It took crews nearly 12 hours to finally recover Charles' body from the wreck. During the time that he was still inside the wreckage, his loved ones started receiving calls from his cell phone. He called his son, his brother, his stepmother, his sister, and his fiancée. There were 35 calls placed in total. the family members would answer the phone each time a call came in, but there was never anything on the other end except static. Every time they tried to return the call, it would go to voice mail. The family did not know for sure that Charles had been killed, so they held out hope that he was alive and trying to reach them. Rescue workers used the signal from the cell phone to finally find Charles' body. After the body was recovered, it was clear that he had died on impact and could not have made any of the phone calls. At least not physically. The cell phone was never recovered. The cell phone was clearly not on if it was going to straight to voicemail and so there is no way it could be placing calls on its own, nor would a cell phone call several different numbers that just happened to be family members and so the fact that they all received several phone calls, certainly is odd! In the month of April, on the 13th, in 1969, the American comedy movie The Love Bug was released by Walt Disney Productions. The Love Bug is the title character and this character is a 1963 Volkswagon Beetle named Herbie who has a personality and is anthropomorphic. Most of you listeners know exactly what Herbie looks like, even if you haven't seen the movie. He is a pearl-white color with a fabric-sunroof with red and blue racing stripes running over the hood, roof and back end. The number 53 within a circle is painted on each door. The number was chosen by producer Bill Walsh, who was a fan of Los Angeles Dodgers baseball player Don Drysdale and his retired number was 53. The movie was based on the 1961 book Car, Boy, Girl by Gordon Buford and follows the adventures of Herbie, Herbie's driver, Jim Douglas played by Dean Jones, and Jim's love interest, Carole Bennett played by Michele Lee. Buddy Hackett also stars in the film as Jim's enlightened, kind-hearted friend, Tennessee Steinmetz. The villain in the movie is played by English actor David Tomlinson. Herbie's main adventure is race car driving. Spoiler, Herbie does win the big race. This movie was the last live action film produced by Disney under the guidance of Walt Disney. At the confluence of three rivers, sits the East Sussex town of Rye. This is an ancient medieval town that became an important harbor along the English Channel. In the town of Rye, one will find the historic Mermaid Inn. The original building no longer stands, but the current building dates back more than 600 years with the original old cellars still in place. There are several secret passages that were used by smugglers. Some of these smugglers were members of the Hawkhurst Gang and they used the Mermaid Inn as their hideout. The inn has seen a long turbulent history. Today, it is a restaurant, bar and hotel that reputedly has many spirits kicking about in its various rooms. There are stories of cold spots, chairs moving on their own and full-bodied apparitions. Let's explore the history and hauntings of the Mermaid Inn! Rye is an ancient town and it is believed that it derives its name from the word rie. From Roman times, it was a busy harbor as it was located on a huge embayment of the English Channel called the Rye Camber. Rye became a part of the Cinque Ports Confederation in 1189 and this was a series of coastal towns that formed the confederation for military and trade purposes. Rye was considered one of the finer Cinque Ports. The town received its charter from King Edward I in 1289. Fortunes for the port city would take a bad turn when the River Rother changed course and violent storms cut the town off from the sea. The sea and river eventually combined and destroyed the eastern part of the town. In 1377, the French sacked and burned Rye. Eventually, bigger ships needed ports that had deeper waters and the Rye coast was constantly filling up with silt, so the economy began to decline as shipping went elsewhere. Smuggling and fishing took over and by the end of the 17th century, it became widespread throughout Kent and Sussex. Owling was the biggest form of smuggling and that is wool smuggling. Today, it is a small town with a population under 5,000. Rye has become a popular tourist destination with hotels and B&Bs. Mermaid Street in Rye has a steep slope and the the street is cobbled. It is on this street that one will find the Mermaid Inn, which is a Grade II* listed historical inn. The original building that was once here, no longer exists, but its cellars are still here and date back to 1156. The current building was built in 1420. The Tudor style additions were added in the 16th century. The inn is black and white timber-framed. Much of the timber was taken from ships that were being dismantled. The building is also tiled and has carved Caen stone chimney pieces that are embellished with decorations. Several of the fireplaces were formed from secret passages. There is an overhang that is supported on wooden columns with brackets and cross-beams. The building has two stories and an attic. One thing anyone will notice quickly about this place is that there is a lot of carved wood. Many of the rooms also have exposed wooden beams. Inside the building is a pub, restaurant and inn. Sloping ceilings hang over those enjoying a drink at the Giant’s Fireplace Bar, which has an inglenook fireplace and is supported by a beam that traverses the room. If one is looking for food, there are offerings in the large Linen Fold Panelled Restaurant, the Dr Syn dining room or the Boardroom, which is a private dining room. In the Dr Syn's Lounge, one can find wall carvings of Catholic priests who are fleeing to the continent during the Reformation. But there are even more treasures to be found for those of us who enjoy secret tunnels, sliding wall panels and priest-holes. All of these came in handy during the days of the pirates and smugglers. One particular group that made use of the Mermaid Inn was the Hawkhurst Gang. The Hawkhurst Gang was a notorious criminal organization that ran a smuggling ring out of Rye's harbor from 1735 until 1749. Most of southern England suffered under not only their smuggling efforts, but this was a violent and murderous gang. They successfully raided custom houses all along the coast. They eventually were defeated in a battle with the Goudhurst militia in 1747, and two of their leaders were executed at that time, Arthur Gray and Thomas Kingsmill. The gang was very successful and so powerful that they were able to operate in Rye with freedom. On one occasion, they smuggled a huge load of goods off of three large cutters at Pevensey and managed to carry it all inland on 500 pack horses. In the early 1740s, Jeremiah Curtis joined the gang. He had already been part of another violent gang in the Hastings area. He was a brutal man and had a man named Richard Hawkins whipped and beaten to death because he thought he had stolen tea from the gang. The kind of brutality that Curtis brought to the Hawkhurst Gang got locals up in arms and they formed the Goudhurst Band Of Militia led by "General" George Stuart, a former army corporal. When the gang attacked because they were enraged by this act of defiance, several of them were killed and they were forced to withdraw. Eventually, many of them were executed. The inn part of the establishment features 31 rooms that are uniquely named and styled. All of the beds are magnificently carved and are surrounded by dark wood paneling. Each room has a Caen stone fireplace and the windows are latticed. The bathrooms have bear-claw footed bathtubs and updated amenities. Each room is named for a famous person that is a part of the Mermaid's history and filled with antiques. The Rye Royal Room derives its name from a visit by Queen Elizabeth I to Rye in 1573. During that visit, she declared Rye to be royal and presented the town with 100 Gold Angel coins. Dr Syn's Bedchamber is named for Dr Syn, a fictitious character created by the author Russell Thorndike. The character is based on the factual ‘Hawkhurst’ smuggling gang of 600 men. The vicar of Dymchurch, Dr Syn, was portrayed by George Arliss in a 1937 feature film and Patrick McGoohan in a 1960’s Walt Disney version. The author visited the inn several times. The Frank Palmer Room is named for the 700th mayor of Rye. The Bean Room is named after Thomas Bean, the landlord of the Mermaid Inn from 1735 to 1736 and again in 1751. It was at that time that the ‘Hawkhurst Gang’ had taken over. Bean was in collusion with the smugglers in the kidnapping from the Inn of Gabriel Tompkins (Rm 22), the Bailiff of the sheriff of Sussex. The Mrs. Betts Room is named after Mrs Betty Betts, who owned the 16th century cottage that was next to the Mermaid. That cottage was incorporated into the Inn. The Elizabethean Bedchamber is named for Queen Elizabeth I and has a lovely four poster bed. There is also a secret passage, oubliette and a staircase to the old kitchen, which is now the bar. Apparently the inn has more than just history lingering from the past. It is reputedly quite haunted with owners, employees and guests all reporting experiences. The TV show Most Haunted has investigated the location. A local medium visited a previous landlord and inquired about arranging a ghost watch. the landlord agreed and joined the medium. The two were stunned when they witnessed the materialization of two ghostly figures with rapiers who appeared to be dueling with one another. The landlord claimed to witness the fight until it was over. It ended with one spectre running its sword through the chest of the other. The ghost then removed a floorboard and stuffed the dead man's body under it. This scene has been seen more than once and happens in the Elizabethan Room. An obliette is in this room and it is believed that the body is being dropped into this through a trap door. One of the current owners of the Mermaid, Judith Blincow, came downstairs one morning to find two of her guests sleeping on the couch in the lounge. She thought this was quite odd and worried that the room was not to their satisfaction. When she asked them why they were in the lounge, they said they had seen ghostly figures walk through the walls in the room. They refused to return to the room and had to have their things brought out to them. Judith claims to have never experienced a ghost, but enough guests have had experiences that she believes there must be some spirits on the premises. Room 1 is haunted by a lady in gray who sits in a chair by the fireplace. And if a guest leaves their clothes in that chair overnight, they sometimes will find the clothes to be wet in the morning even though there is no leaking water overhead or anywhere near the clothes. Room 17 is said to be haunted by the wife of the founder of the Hawkhurst Gang, George Gray. She haunted a rocking chair in the room and guests claimed to wake up in the middle of the night and see the chair rocking on its own and found the room icy cold. Owners finally removed the chair because there were so many complaints. Another member of the Hawkhurst Gang had a girlfriend who served as a maid at the inn and she was murdered by another one of the smugglers because he felt she talked too much about their exploits. She has been seen throughout the inn. There are two ladies in white found here. One is in Room 14 and the other is in Room 15. Room 7 is haunted by a man in period clothing and he likes to sit on the edge of beds when guests are trying to sleep. Room 16 has a male ghost that has made appearances. Other phenomenon that are regularly reported are cold spots in rooms and rocking chairs that move without anyone sitting in them. A bartender turned in his notice after he was tending to the fire and a few bottles at the end of the room flew off the shelf. The Mermaid Inn has been around a long time and served many people. It's an exquisitely decorated building that harkens back to the Tudor period and beyond. Are there remnants of its turbulent past still hanging around in the present in the form of spirits? Is the Mermaid Inn haunted? That is for you to decide! In 1754, war broke out between the French and English. They were fighting over ownership of the Ohio Valley and both sides reached out to various Native American tribes for aid in their efforts. Cherokee villages were raided by rival tribes loyal to the French while Cherokee warriors were out fighting for the English. The Overhill Cherokees demanded that the English provide their villages with more protection, so they built Fort Loudoun, which was located at the mouth of the Tellico River, on the south bank of the Little Tennessee. The French began to lose, so they changed tactics and told the Cherokee that the English would eventually drive them from their lands, but they promised that they had no interest in settling Cherokee lands. this caused the Cherokee to switch sides in 1759 and they raided English settlements. They eventually laid siege to Fort Loudoun. An officer who was wounded in the fight, staggered into a Native American village. The chief took pity on him and his daughter, Nocatula, nursed the officer back to health. The two fell in love and the officer was accepted into the tribe and given the name Connestoga. Soon he and Nocatula were married. There was a problem though. Another member of the tribe was in love with Nocatula and he hated white men. One day, he plunged a knife deep into Connestoga's chest. Nocatula found him dying and pledged her eternal love to him and then she plunged a knife into her own chest. The chief buried the couple and in Connestoga's hand he placed an acorn and in his daughter's, he placed a hackberry. These two seeds grew into healthy trees and thrived for over 150 years before they eventually died. People in the town planted two more of the same trees over the graves, but they died and the legend claims that the couple rejected the replacements. Today, the stumps of the original trees remain as symbols of the couple's everlasting love and if this legend is actually true, it certainly is odd! In the month of April, on the 5th, in 1856, African-American educator Booker T. Washington was born a slave in Franklin County, Virginia. Washington was nine-years-old when the Civil War ended. He taught himself the alphabet and worked as a houseboy for a white family where he learned many of his values. He was educated at Hampton Institute, one of the earliest freedmen’s schools devoted to industrial education. He went on to one of his greatest endeavors when he founded Tuskegee Institute in 1881. This was a black school in Alabama devoted to industrial and moral education and to the training of public school teachers. He created a national political network of schools and became black adviser to Presidents Theodore Roosevelt and William Howard Taft. His widely read autobiography, Up from Slavery, is a classic. Washington's health deteriorated in 1915 and he was diagnosed by two different doctors with having Bright's disease. He was told he only had a few days and he asked to be taken to Tuskegee to die. He made it there on November 14, 1915 and died a few hours later at the age of 59. He was buried on the campus of Tuskegee University near the University Chapel. Old Town Spring is just outside Houston in Texas and started as a railroad boomtown in the mid-1800s. It then became a farming community that grew cotton and sugar cane, followed by a saloon town and finally today, it is a quaint shopping district full of historic buildings brought in from other towns. This is home to the Texas Heritage Festival and Texas Crawfish Festival. It is also home to a plethora of ghosts, both young and old. Each shop seems to have its own story. Listener Dolly Ruther joins us to share her experiences with the history and haunting of Old Town Spring! Dolly shared nearly an hour of the information she gathered from shop owners, a ghost tour she took and the book, Haunted Old Town Spring by Cathy Nance. Spring is a quaint little town that sounds like a fun excursion off the beaten path. A welcome respit from the big city of Houston. Could many of these shops really be haunted by ghosts of the pasts they brought with them when they were moved to town? Is Old Town Spring haunted? That is for you to decide! There is a Gothic church standing in the village of Sedlec in the Czech Republic that has come to be known as The Bone Church. From the outside, it appears to be a typical church, but when one enters the basement they find a creepily beautiful ossuary. A local abbot made a pilgrimage to Jerusalem in the 13th century and brought back sacred soil to spread in the church's cemetery. After that, everybody wanted to be buried in that graveyard. The Plague led to 30,000 victims being added to the cemetery. More burials came after the Crusades. The church was built in the 15th century and many bones had to be moved at that time, so they were stacked in the ossuary beneath the church. The church hired a local woodcarver named Francis Rint in 1870 to help create something beautiful from the huge stack of bones. The bones were bleached and carved and then used to decorate the basement. Rint made chains of skulls to stretch across entryways and hips and femurs were used to make chalices and crosses. The Sedlec Ossuary's pièce de résistance is a gorgeous chandelier that incorporates every single bone in the human body at least once. The bones are cleaned individually with a toothbrush. The Bone Church is the second most-visited destination in the Czech Republic. An ossuary completely decorated with human bones, certainly is odd! In the month of April, on the 3rd, in 1995, Supreme Court Justice Sandra Day O'Connor became the first woman to preside over the Court when she sat in for Chief Justice William H. Rehnquist who was out of town. Sandra Day was born in Texas in 1930. She attended Stanford University and received a B.A. in economics in 1950 and then moved onto the Stanford Law School. She served on the Stanford Law Review with its presiding editor-in-chief, future Supreme Court Chief Justice William Rehnquist. She even dated him for a bit and one has to wonder what they would have thought at the time if they knew they would both be on the U.S. Supreme Court one day and that she would sit in for him as Chief Justice. She married John Jay O'Connor III in 1952 and eventually served as assistant Attorney General of Arizona from 1965 to 1969. Then her time of female firsts started with her becoming the first woman to serve as Arizona's or any state's Majority Leader when she entered the Arizona Senate. In 1974, she was elected to the Maricopa County Superior Court and in 1979 she was elevated to the Arizona State Court of Appeals. She served on the Court of Appeals-Division One until 1981. In that year, she broke a major glass ceiling when she was appointed to the Supreme Court by President Ronald Reagan. This year, 2018, the Jewish community observes Yom HaShoah starting at sundown on April 11th. Yom HaShoah (Yom Hash o way) is Holocaust Remembrance Day, a day that the country of Israel observes to commemorate the extermination of approximately six million Jews and five million others who perished in the Holocaust. Concentration camps were built in several areas of Europe to accomplish what the Nazis referred to as "The Final Solution." A few of them still stand today as reminders of a very dark time in history. With the energy created by the torture and death that occurred in these camps, it is easy to believe that haunting activity would be experienced at them. No official paranormal investigations have taken place at any camp out of respect and because such investigations would seem sacrilegious, but there are many reports of weird things being reported by people who have visited. Join us as we explore the history and hauntings of the Nazi Death Camps of the Holocaust. Yom HaShoah is a national memorial day and public holiday in Israel. The holiday was inaugurated in 1953, and signed into law by the Prime Minister of Israel, David Ben-Gurion, and the President of Israel, Yitzhak Ben-Zvi. The full name of the day “Yom HaShoah Ve-Hagevurah,” which translates to the "Day of (remembrance of) the Holocaust and the Heroism." It is marked on the 27th day in the month of Nisan, which can fall in either April or May depending on the year. This is a week after the end of the Passover holiday and a week before Yom Hazikaron, which is Memorial Day for Israel's fallen soldiers. This marks the anniversary of the Warsaw Ghetto uprising. The date was selected in a resolution passed by Israel's Parliament, the Knesset, on April 12, 1951. Jewish communities around the world observe the holiday as well as individuals worldwide. Adolf Hitler was appointed Chancellor of Germany on January 30, 1933. Two months later, Nazis opened Dachau concentration camp near Munich, then Buchenwald near Weimar in central Germany, followed by Sachsenhausen near Berlin and Ravensbrück for women. Laws against Jews start to ramp up in Germany, with them becoming more extensive in 1934. The year 1938 would find the Nazis implementing the strictest laws against Jews and requiring them to register their wealth and property and businesses. Other countries would start following suit in approving the Nuremberg Laws, which were racist and antisemitic laws. The gathering up of Jews would begin on September 21st in 1939 when instructions were issued to SS Einsatzgruppen (special action squads) in Poland regarding treatment of Jews, directing that Jews be gathered into ghettos near railroads for the future "final goal." A census is also ordered and the establishment of Jewish administrative councils within the ghettos were formed to implement Nazi policies and decrees. Heinrich Himmler visits Auschwitz for the first time on March 1, 1941. He orders a massive expansion, including a new compound to be built at nearby Birkenau that can hold 100,000 prisoners. Auschwitz was a series of concentration camps set up in Poland 37 miles west of Krakow in 1940, to house political prisoners. The original building was an abandoned Polish army barracks. The camp was named after a nearby town.The Auschwitz-Birkenau camp, or Auschwitz II, would become a death complex. Around 1.3 million people would be transported to the Auschwitz camp from 1940 to 1945 and the break down of those numbers is as follows: Jews (1,095,000 deported to Auschwitz, of whom 960,000 died); Poles (147,000 deported, of whom 74,000 died); Roma (23,000 deported, of whom 21,000 died); Soviet prisoners of war (15,000 deported and died); and other nationalities (25,000 deported, of whom 12,000 died). To facilitate killing, Auschwitz I was equipped with a gas chamber and crematorium.The original gas chamber was in the basement of the prison block, Block 11, and then later, a permanent gas chamber was constructed as part of the original crematorium outside the prisoner compound. It was at this camp that SS physicians like Josef Mengele carried out medical experiments in the hospital and conducted pseudoscientific research on infants, twins, and little people. These "physicians" also performed forced sterilizations and castrations of adults. The Black Wall was located between the medical-experiments barracks and Prison Block 11 and is where SS guards executed thousands of prisoners. The Auschwitz-Birkenau camp was built in October 1941 and eventually had the largest total prisoner population. Electrified barbed-wire fences divided the camp into ten sections that housed different populations like women, men, a family camp for Roma (Gypsies) and a family camp for Jewish families deported from the Theresienstadt ghetto. The killing center here played a central role in the Nazi's Final Solution. During the summer and autumn of 1941, Zyklon B gas was introduced into the German concentration camp system as a means for murder. Zyklon B would be used in all the gas chambers at the Auschwitz complex. The gas chambers at Birkenau were originally two converted farmhouses, but they didn't work as effectively as the SS desired. Then four large crematorium buildings were constructed between March and June 1943 and these buildings had three components: a disrobing area, a large gas chamber, and crematorium ovens. The SS continued gassing operations at Auschwitz-Birkenau until November 1944. Death marches were conducted in January of 1945 as the Nazis emptied out the camp when Soviet forces approached. A few days after, all but the sick and dying were evacuated, Auschwitz was liberated. Dachau was the first concentration camp built by the Nazis and construction began in March 1933. The grounds had originally been an abandoned munitions factory. Dachau was named for the nearby medieval town, 10 miles northwest of Munich. Few Jews were imprisoned here in the beginning. Most prisoners were political prisoners, repeat criminals, gays, Jehovah's Witnesses and Roma People (Gypsies.) Hitler wanted to make sure that camps could operate as they wished, so after a Munich schoolteacher was beaten and strangled to death at Dachau in 1933, he issued an edict stating that Dachau and all other concentration camps were not to be subjected to German law as it applied to German citizens. This put the SS administrators in charge. In 1937, it was expanded and became the training center for SS concentration camp guards. The Dachau camp system grew to 100 sub-camps and 11,000 Jews were brought in to join the other prisoners. Thousands of Soviet prisoners of war were sent to Dachau starting in 1941 and most were taken to a nearby rifle range and shot to death. In 1942, construction began at Dachau on Barrack X, which was used as a crematorium that had four sizeable ovens. Most of Dachau's prisoners were sent to other camps to be exterminated when they became ill or unable to work as Dachau was mainly a work camp. By 1944, the camp was overcrowded with 30,000 prisoners. US forces liberated Dachau in April 1945, but not before the Nazis sent the able bodied prisoners, about 7,000, on a death march to Tegernsee. In 1965, a memorial site was created on the grounds of the former Dachau concentration camp and people can visit the grounds and access the library. Bergen-Belsen was the scene of the death of 50,000 people, including Anne Frank. The camp was established in 1940. It was in a location south of the small towns of Bergen and Belsen, about 11 miles north of Celle, Germany, and that is how it came to be named. Like the other death camps, Bergen-Belsen was composed of numerous camps. The original purpose of this camp was to house prisoners-of-war, but in April of 1943 the SS Economic-Administration Main Office that headed up the concentration camp system, took over a portion of Bergen-Belsen and converted it into a civilian residence camp. As the Final Solution ramped up, the camp was converted to a concentration camp. World War II started winding down in early 1945 with the Allied and Soviet forces getting a foothold into Germany. This forced the Nazis to start moving more of their prisoners and Bergen-Belsen became a collection camp for those that survived the death marches. Resources were overwhelmed and the POW portion of the camp was switched to a large womens camp. This camp housed women evacuated from Flossenbürg, Gross-Rosen, Ravensbrück, Neuengamme, Mauthausen, and Buchenwald concentration camps. The camp had a population of 7,300 prisoners in July of 1944. By April of 1945, there were 60,000 prisoners, so you can imagine the conditions. Diseases like typhus, tuberculosis, typhoid fever, and dysentery were rampant and there was little food or water. That anyone survived is a miracle. On April 15, 1945, British forces liberated Bergen-Belsen. They found thousands of unburied corpses and around sixty thousand prisoners in the camp. More than 13,000 of the freed would die after liberation as they were too ill to recover. Prisoners that were going to be gassed in all of the camps were stripped of clothes, belongings and the fillings in their teeth. After being killed in the gas chambers, their bodies were thrown into mass graves. Those that were stronger were kept alive to do forced labor. The conditions were horrible and few survived. The temperatures were freezing, disease was rampant and they were starved. Some people managed to escape, but nobody would believe that such horrible camps existed. When the camps were finally liberated after the war ended, the world would finally see just how horrible the conditions were and find out that millions of people were murdered. Because of the pain and suffering and death, it is easy to believe that the concentration camps would be havens for spiritual activity from both the innocent who were murdered or horribly treated or as manifestations from the utter evil perpetuated on the victims of the Holocaust. No professional paranormal group has ever investigated in a former death camp. These investigators are as uncomfortable with the idea of appearing to be disrespectful as we are to talk about the haunting activity. Is it the intensity of the suffering at these places that makes it feel wrong to talk about ghosts? Could it possibly help some lost and torture souls if people did come in and talk to them, listen to their stories or help try to cross them over? Why is it okay to investigate asylums or places of tragedy, but not a death camp. For us, talking about the spirits here helps to magnify just how horrible these places were and one thing we can never allow to happen,is for people to forget or be unaware of what happened. And we certainly do not want history to repeat such atrocities. Auschwitz is considered one of the world’s most haunted locations. Visitors have reported feeling multiple cold spots while wandering the fields and after entering through the gates, there is a sense of dread and sadness that is overwhelming. There are people who suddenly burst into tears after entering and they can't contain themselves until they leave. The saddest stories are those that claim to feel the tiny hands of unseen children slip into theirs in the children’s centers or the gas chamber or when they stop to look at the heaps of shoes taken from prisoners and notice a child's tiny shoe in the pile. 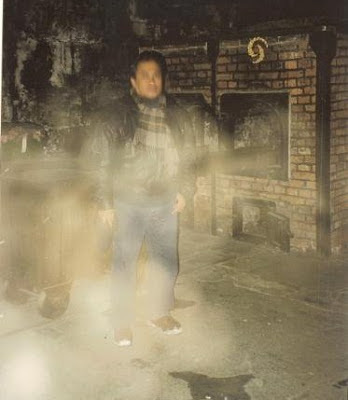 Visitors report that their cameras have jammed as they tried to photograph displays and some have caught strange shapes and orbs in photos. Disembodied voices have been heard pleading for helpin the rooms were bunk beds are on display. And truly chilling is that birds do not enter the camp, and in the rare times that they do, they do not sing. There is only one gas chamber still left at Auschwitz and it is small and dark. Many visitors have reported hearing weird noises and some have captured pictures and videos featuring strange figures in the gas chamber. Cold, moving spots in the air are felt and the touch of an unseen hand on a shoulder or back is not unusual. A Girl from Finland writes the Paranormal Blogging Blog and she wrote of her experiences visiting Auschwitz, "After that we went to the barrack number 13, the worst barrack in Auschwitz. There they...tested the Zycklon B [gas]. They killed thousands of humans in that barrack, or in the cellar actually. When we went down the stairs, I finally noticed something. It was cold, just like in haunted places. I started to hear weird noise from my headphones. It was like screaming, but not very loud. Everyone else noticed it too. When I turned my headphones off, it ended. I could also sense the despair again. Some people unexpectedly started to cry. There was a small room with a large candle. It was to respect the memory of a man who asked to get killed instead of a man who had a family. The man he saved by his death survived from Auschwitz alive." 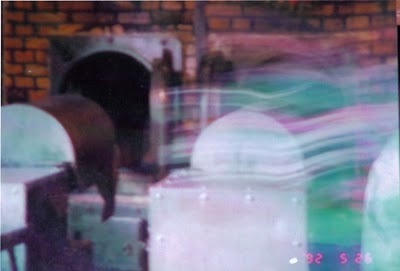 Also from the Paranormal Blogging website: "I got one picture of something paranormal. There were barracks on two sides of the railroad tracks. The other side was not open for tourists and visitors. But I could clearly see a man in one of the barracks. I took a picture of it with zoom. It looks like it is wearing the white stringed hat of Auschwitz prisoner. Maybe I captured the famous spirit of Auschwitz? I am sorry about the bad resolution. Also see the orbs around the figure." Dachau once housed over 200,000 prisoners and 25,000 people died there. Many Nazi guards came to an end along the “death walls” of the camp as Allied forces executed them after witnessing the horrors of the camp and the condition of the prisoners. The city of Dachau lives under the shadow of this dark past and has been seeking redemption ever since. The dead speak through memorials and placards, bullet holes in the walls and smoked-stained crematory chimneys. People report hearing audible cries of pain and feeling as though they are being touched. Again, an overwhelming feeling of sorrow is felt. bamastrick07 wrote, "I am in the Army I am stationed in Germany. My wife and I recently took a trip to Dachau Concentration Camp in Munich. I watched Ghost Hunters a lot and was really interested in paranormal activity. When we arrived there you could feel a strong presence in the air. The camp was really big and it took almost a whole day to walk through it all. But what I really don't understand and while I'm writing this is because, while walking through the area where the barracks used to be, I got sick. Just out of no where. As I walked a little further, it went away. My question is, was that paranormal? I was feeling fine all day until I got to that section. My wife and I walked to the old crematory. There were stories how people were tortured. As we walked in, I was taking pictures, and as my wife walked in and she almost passed out and had a severe headache. After we walked out, it went away. I took some pictures inside there and you could see too small orbs in the picture. So, again my question is, did my wife and I have paranormal experiences? I know that this isn't necessarily a story but it has been a question on my mind for quite sometime now." A 17th century castle in the Czech town of Ostrov was captured by the Nazis in 1939 and they turned into a concentration camp for Czech resistance fighters. These prisoners were treated just as poorly as the Jews and others. The castle now houses a museum and there is a claim that CCTV footage captured paranormal activity. The staff decided to review footage after objects allegedly started to vanish. They witnessed a strange figure in the footage. The shadowy figure appears to move in front of the camera after all rooms were locked and closed. Local media reported the story after the police were contacted. Apparently, the "ghost" was seen on footage twice in one month. The camera is in the exhibition room where treasures belonging to the former castle owners - the Schlick family - are stocked. Paranormal investigator Hana Mackeova was asked to come and investigate. She said, "I felt some negative zones in some rooms. Something is definitely wrong there. I was very weak, felt sick and I had to leave. "Local council employee Zuzana Zelezna, one of those who have offices in the castle, said: "The ghost removes objects at night." Bergen-Belsen and Auschwitz are rumored to be haunted by an infamous ghost. This spirit is said to belong to one of the most vile women to have ever lived and that is Irma Grese. She is one of the most notorious guards to come out of Auschwitz. She was born in Germany in 1923 and became fascinated by the Nazi Female Youth. Her father disowned her after she was stationed at her first concentration camp in 1940. She arrived at Auschwitz in 1943 and was placed in charge of the 30,000 female Jewish prisoners there. She relished her role in deciding who was sent to the gas chambers and who survived. For those she allowed to escape death in the gas chambers, she dealt out degrading punishments and limited food, so most of the women starved. It is rumored that she was the lover of Dr. Mengele while at Auschwitz. In 1945, she was sent to Bergen-Belsen were her abusive behavior and murderous ways continued. After the war, she was arrested. Grese was described as "the beautiful beast" by those who testified against her at her trial. During these trials, it also came to light that she owned a light shade made of the human skin of her victims. She was found guilty and hanged for her crimes. A story about that claims that no one wanted to be responsible for executing a woman, so a Jewish hangman named Lutzheim volunteered. Grese hated Jews,of course, and screamed that if he touched her, she would return to haunt those who sentenced her to death. her spectre started to be seen at both Bergen-Belsen and Auschwitz in 1948. So it would seem that she did not come back to haunt those who put her to death, but to roam the places of her atrocities. The Final Solution, thankfully, did not reach its goal of total annihilation of the Jewish people. It is important that we continue to speak of this time in history, so that it is never repeated again. Whether there are ghosts at any of these camps is really irrelevant as the true hauntings of these death camps are what has been left behind as a testament to just how cruel and horrible some human beings can be to each other. And whether one believes in ghosts or not, we think we can all agree that these camps are indeed haunted in one way or the other.